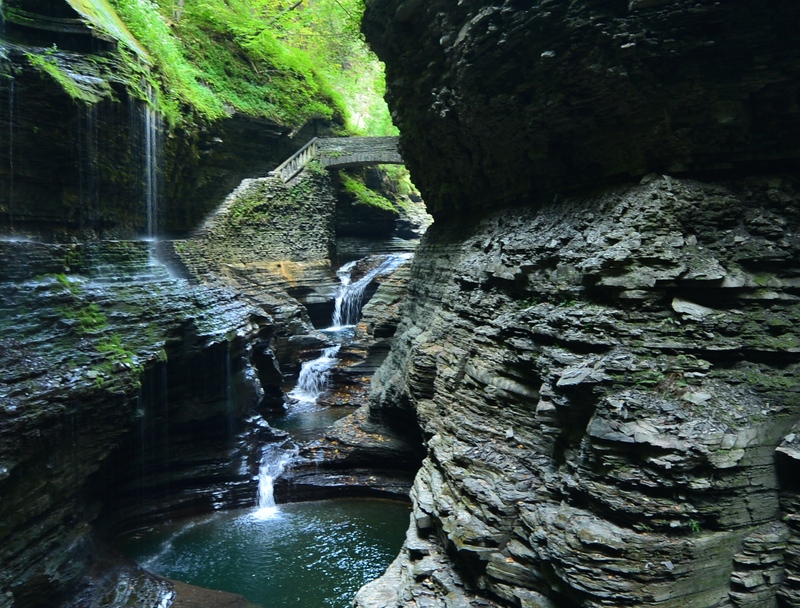 An earlier – this year – visit to Watkins Glen, New York! We visited the area traveling from Upper New York State (Sandy Beach) to Buffalo New York – where Donald had a Buffalo Bills game to attend on opening day. The Finger Lakes looked like a good stop-over as we had read about the lovely area, good wine and good times. We parked the bus at a local KOA/Walkins Glen – which was probably the nicest KOA we have visited. 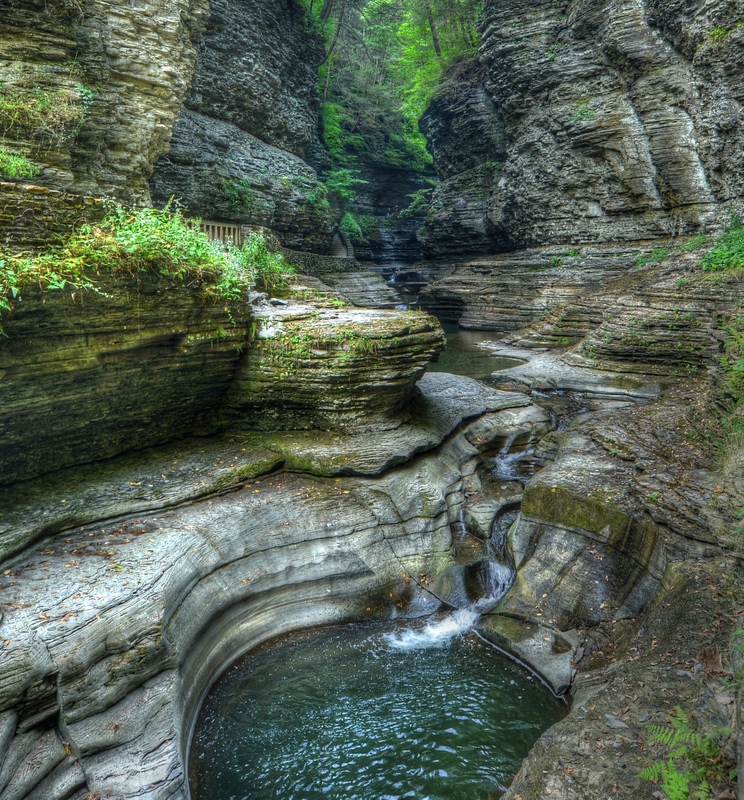 While crowed (like every KOA) and not exactly scenic (like almost every KOA…) the park is centrally located, close to the town of Watkins Glen and the State park – which is also in town!! shuttle bus is available between the park interior and the park entrance in town. Nominal fee for the ride. 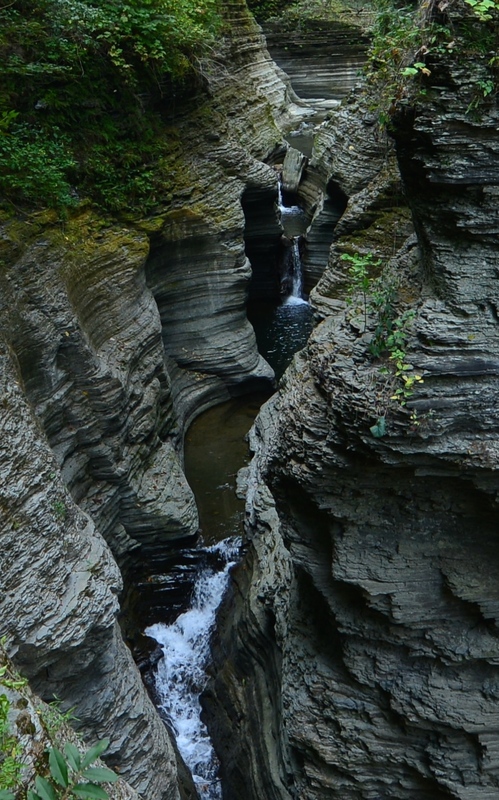 The hike is fairly easy – once we spoke with a knowledgable ranger who reassured me I could do the hike, i felt more confident about hiking the Gorge…..
Watkins Glen does offer a campground – which is limits Recreational Vehicle length to 30 feet – so not an option for us. While KOA is not my first choice, it was a good alternative for us. The falls are created by Glen Creek as it cuts through the the narrow gorge. 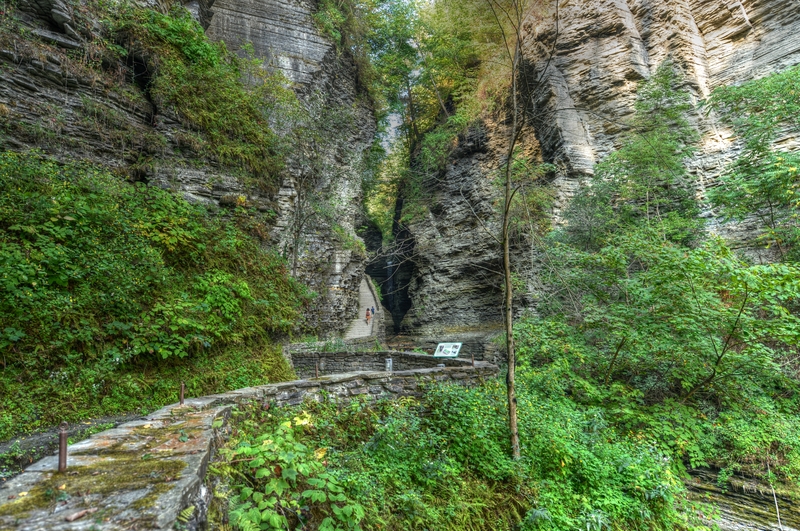 The Park offers three trails that cut through the park – the primary trail runs alongside the gorge & Glen Creek. 19 falls are available for your viewing pleasure. The original owners of the land were the Seneca Indians – known as the Great Hill People – and the most powerful tribe of the region. They were responsible for guarding the Western Half of the Iroquois Confederacy. John & Charles Watkins purchased the land from New York State and establishes industries lumber, gristmill, blacksmith. The poor roads in the area prevented these from flourishing – the Erie Canal opened up the area to trade and opened up the lakes (Seneca and Canuga) as transportation hubs. Salt mines were discovered – during exploration for oil- near the Glen and are mined to this day. A Catholic cemetery is oddly placed adjacent to one of the hiking trails. Established 1874, the occupants have a nice view of the falls. 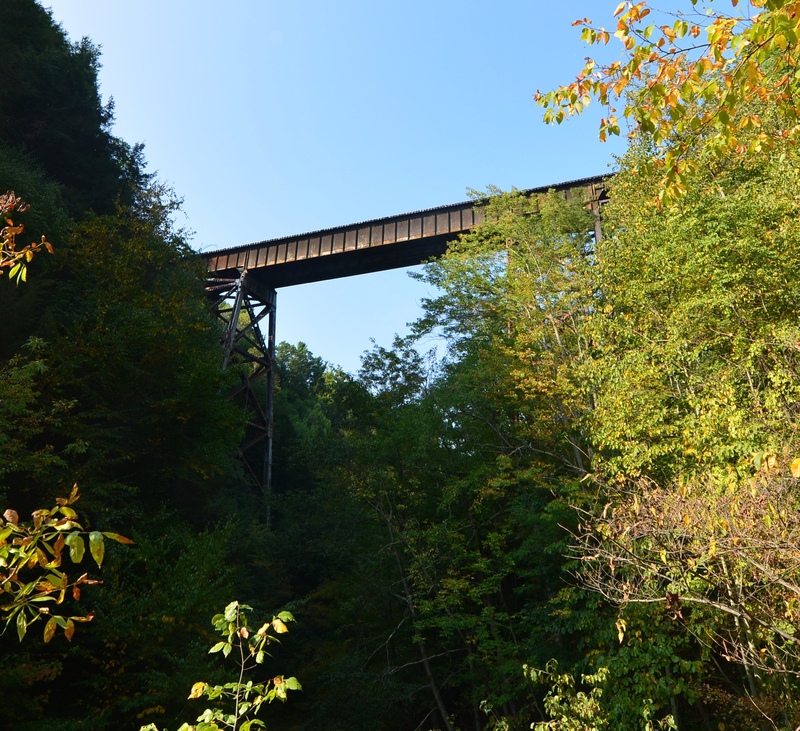 The Civilian Conservation Corps rebuilt the park and the rail trestle after a devastating flood in 1935 that wiped out the park infrastructure. 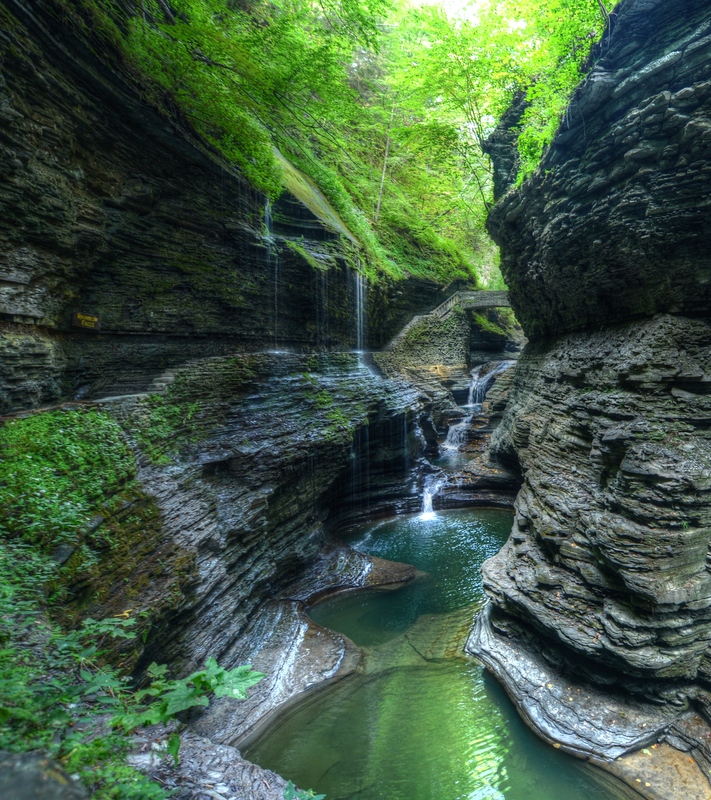 Watkins Glen is a lovely park and well worth a Visit! For your RV stay, you might consider staying at the community Clute Memorial Park. Crowded but across the street from the water and a short walk to ‘downtown’ Watkins Glen. Wow…that’s beautiful! We’ve done some camping around the Finger Lakes, but never at Watkins Glen. Thanks for the tour and putting this on our radar! 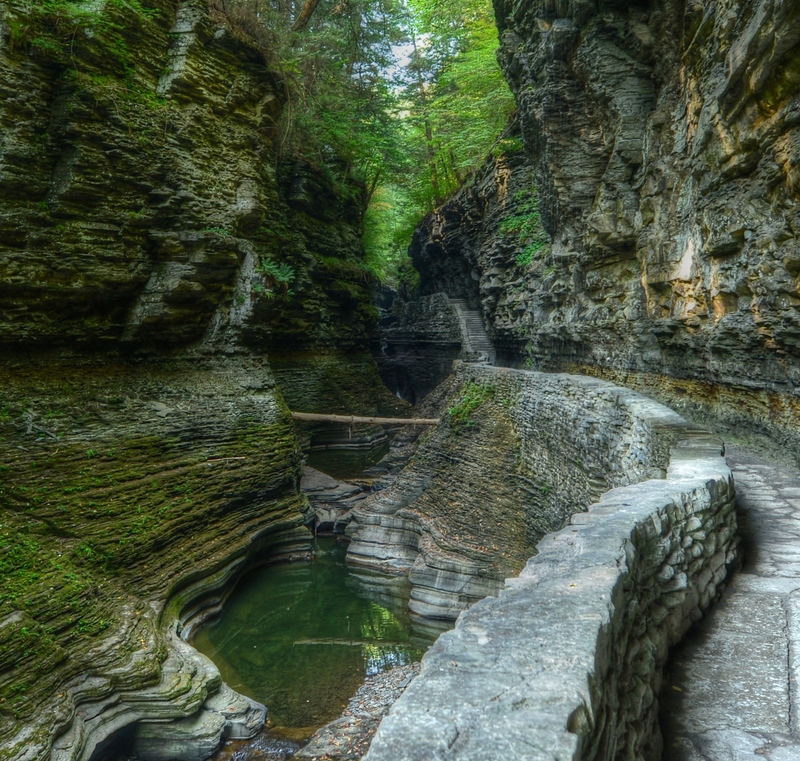 Yes – Watkins Glen was a great spot. A nice little town as a bonus visit. thanks for reading our blog! Thanks – a record number in a short distance. Amazing! Looking forward to travelling that part of the country, we’ve only been a few places so far and loved it. Thanks! The trip was my Husband’s idea – I only wanted to go to the West Coast. We had a great trip and looking forward to doing the East Coast again! Thanks for reading our blog!